Michael says strawberry pots are the perfect solution to growing these summer fruits in a limited space. Most of us don't have room to cultivate rows and rows of our own strawberries. But contrary to what you might think, it's relatively easy to grow strawberries in a container, so you can enjoy the superb fresh flavor of this quintessential summer fruit without paying super-high supermarket prices. 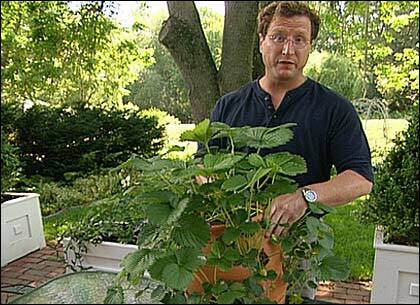 Michael's technique makes use of a special terra cotta container called a strawberry pot, widely available from garden centers, and it's a perfect solution for strawberries in several ways. 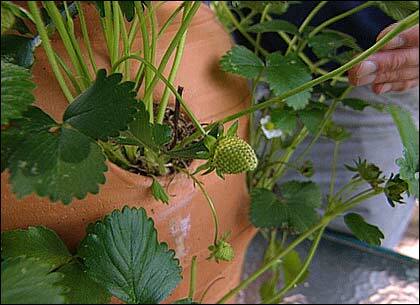 The holes on a strawberry pot allow the berry to hang instead of lie on the ground where they are susceptible to pests and rot. First, it's important to know that strawberries are a shallow-rooted plant that tend to grow in clumps and send out "trailers" from the main plant. For this reason, they're perfect candidates for "pocket-planting." The multiple holes around the surface of the strawberry facilitate this growing habit, keeping the plants separate and allowing you to grow several at once out of the same container. 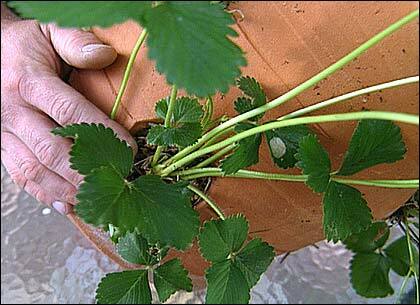 Second, strawberries don't like to have "wet feet," so this container provides excellent drainage. Most varieties of strawberries are also susceptible to a few different kinds of disease, which using sterile soil will help prevent. When your plants begin to produce fruit, the berries are hanging, rather than lying on the ground, reducing the risk of damage from both pests and rot. And of course weeds will be less of a problem too. When it's time to plant your strawberries in the early spring, start by filling up the strawberry pot layer by layer using both potting soil and fertilizer, planting your strawberry pips at each of the holes. (Michael also recommends placing some moss around the side holes to help keep the soil in.) Then just keep layering up with soil and fertilizer all the way to the top. Michael recommends placing moss around the holes to keep the soil in. Here's another trick Michael suggests: Before you actually begin planting, get a length of PVC pipe about equal to the height of your pot and drill holes in it all around. Stand the pipe in the center as you fill the container, and it will supply a direct conduit through which you can evenly introduce liquid fertilizer whenever you need it. As a final suggestion, when you're shopping for the specific type of strawberry you want to grow, Michael says be sure to get what's known as a "day-neutral" variety. That means the plant will be unfazed by the midsummer transition from lengthening to shortening days and continue to bear fruit all season. This segment appears in show #2713.